The metal detection systems are equipped with the new INTUITY metal detection coil. With multi-simultaneous-frequency technology INTUITY reaches a scanning sensitivity that is up to 50 percent higher than in other systems on the market. Since this coil operates with multiple frequencies in parallel, highest product purity is ensured also in demanding applications with a high product effect. With the new developed INTUITY CONTROL user interface the system also offers improved ease of operation. 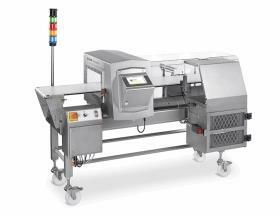 With the VARICON+ and UNICON+ metal detection systems both packed products and meat that is transported in E1/E2 boxes (fresh or frozen) can be inspected for accidental metal contaminations. The systems even detect smallest metal particles in products and thus ensure that meat and sausage products are free from metallic contaminations.